Why? Because every time I go out, I end up eating pizza, or burgers and fries, or tater tots, or something along those lines. Apparently potatoes and cheese are my culinary Kryptonite. It’s time for me to expand my horizons. But it also means I need to get all the cheesy posts I’ve been saving published before Wednesday so I don’t end up tormenting myself! 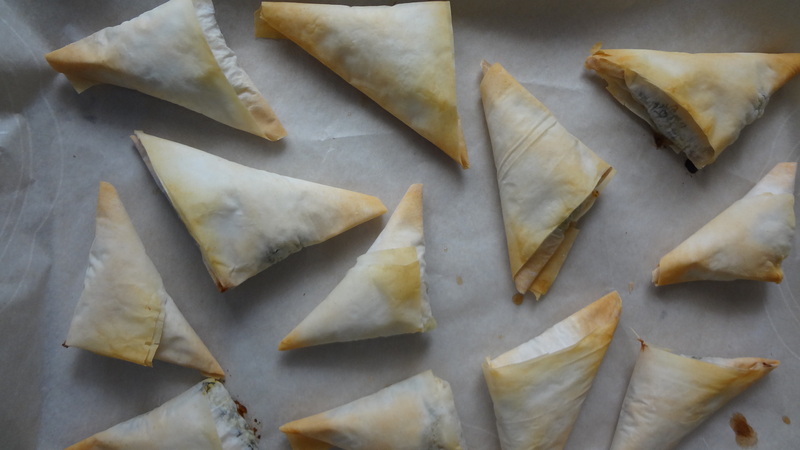 Making these adorable spanakopita triangles was much easier than I thought it would be. Once you get the folding trick down, they are a snap to make. So if you lucky ducks who can still eat cheesy goodness for the next 40 days are feeling like adding a little variety to your appetizer options: 1. I’m so jealous; 2. This is a great way to do it. 1. Preheat your oven to 375°F. Unroll your phyllo, and cover the stack with 2 overlapping sheets of plastic wrap and then a dampened kitchen towel. As you get more confident, you could skip this step, but the phyllo does dry out very very quickly – so be warned! 2. Take two phyllo sheets from the stack and place them with the long side nearest you (keep remaining sheets covered). Cut buttered phyllo stack along the shorter length into 6 equal strips (roughly 12- by 2 3/4-inch). 3. Put a heaping teaspoon of filling near the bottom right-hand corner of a strip, then fold corner of phyllo diagonally up and to the left to enclose filling and form a triangle. Fold the whole “triangle” up, so the pointy tip still aligns with the left-hand side of the strip. Then bring the now bottom left corner up to the right and continue folding the strip (like a flag), maintaining triangle shape. Put triangle, seam side down, on a large baking sheet and brush top with butter. Make more triangles in same manner, until all of the filling is used up. 4. Bake triangles in middle of oven until golden brown, 20 to 25 minutes, then transfer to a rack to cool slightly. These are best served immediately. 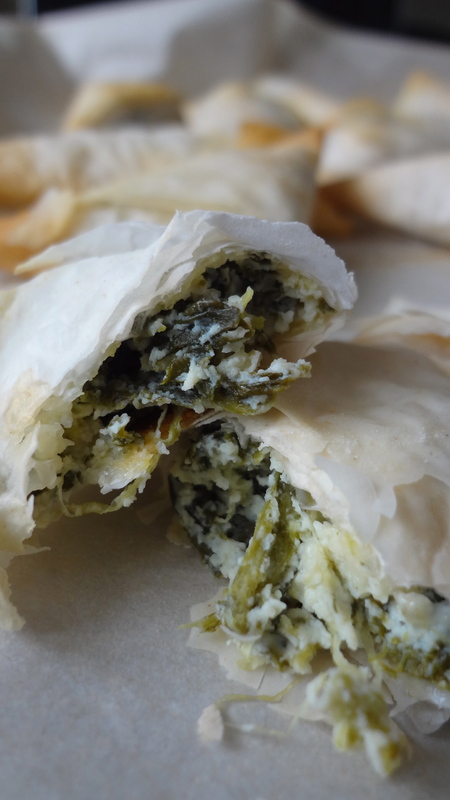 The phyllo will loose its crispy-ness if you wait too long to eat them. If you’re making these ahead of time, wrap them tightly, and freeze them before cooking them. Bake them straight from frozen, just increase the cooking time. 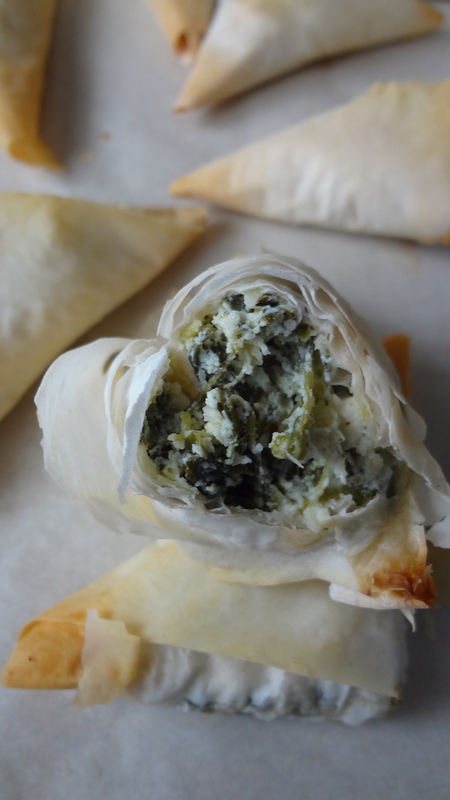 This entry was posted in Uncategorized and tagged appetizers, Baking, cream cheese, Feta, make a head, phyllo, ricotta, Spanakopita, spanakopita bites, spanakopita triangles, Spinach by theculinarycapers. Bookmark the permalink.